AICHI (TR) – Thai authorities have extradited a former Japanese organized crime member who is suspected in the murder of a gangster in Mie Prefecture 15 years ago, reports TBS News (Feb. 2). At around 9:30 a.m. on Friday, Shigeharu Shirai, 74, arrived on a flight from Thailand at Chubu Centrair International Airport in Aichi Prefecture. Police arrested Shirai on suspicion of murder and violating the Swords and Firearms Control Law over the shooting death of an upper-level member of the Kodo-kai, an affiliate gang of the Yamaguchi-gumi, in the town of Takasucho in Tsu City in July of 2003. 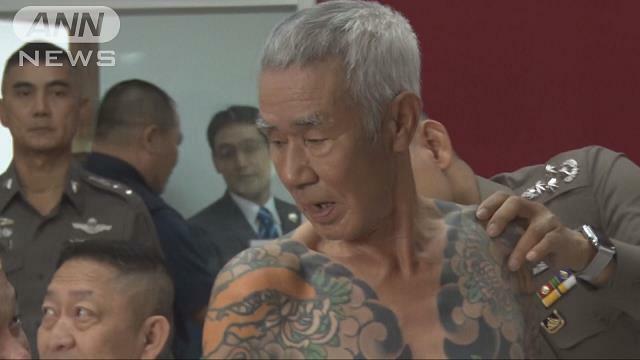 In a video provided by Thai police, Shirai was shown wearing a baseball cap and a short-sleeve shirt that he pulled down to reveal colorful irezumi tattoos, which are often associated with underworld figures, on his arms and torso.